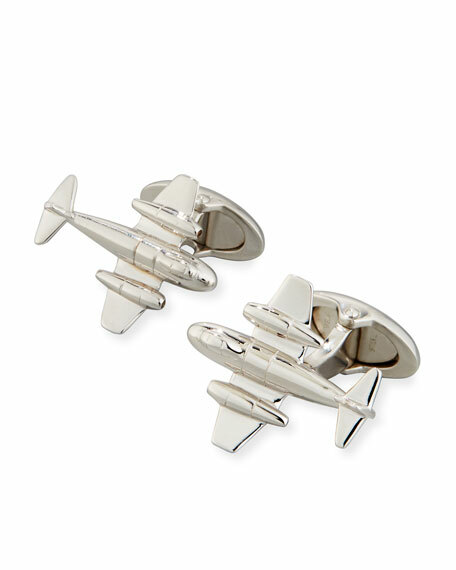 dunhill cuff links featuring the Gloster Meteor, Britain's first jet engine powered plane to fly in World War II. Cufflinks Inc. three-dimensional Day of the Dead sugar skull cuff links. Sterling silver with gold plating. Rhinestone eye details. Approx. Cufflinks Inc. three-dimensional Day of the Dead sugar skull cuff links. Sterling silver with gold plating. Rhinestone eye details. Approx. 5/8" x 3/4". Round swivel backs. dunhill swivel cuff links in gold-plated brass with functional 3-D rotation. Logo-engraved center ring. Black mother-of-pearl inlays. 0.7" x 0.7"
dunhill swivel cuff links in gold-plated brass with functional 3-D rotation. Logo-engraved center ring. Black mother-of-pearl inlays. 0.7" x 0.7" x 1.0". Swivel findings.